Some Chrysler workers were critical Monday of President Barack Obama's rejection of automaker turnaround plans and looked to a proposed Chrysler partnership with Italy's Fiat SpA as their company's last chance to survive the industry downturn. "Right now it looks like our only hope," 37-year-old lineman Douglas Kozak said after arriving at the Warren Truck Assembly plant. "You've got to expect the worst and hope for the best." The White House says Auburn Hills-based Chrysler and Detroit-based General Motors Corp. have not submitted acceptable restructuring plans. GM chairman Rick Wagoner was forced out Sunday, and Mr. Obama said the companies must do more to receive additional financial aid from the government. 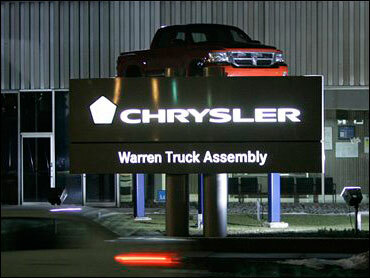 Chrysler reportedly has been given a 30-day window to complete a proposed partnership with Fiat. The government will offer up to $6 billion if they can negotiate a deal before time runs out. If a Chrysler-Fiat deal cannot be completed, Washington may walk away. A union official representing hourly workers at a GM transmission plant in Warren said he was shocked when he heard Wagoner had been forced out, but not entirely surprised. "The president is making someone be (responsible) for what's going on," said Frank Rowser, financial secretary for UAW Local 909. "They're using him as a fall guy." Some workers were critical of what they see as a double standard in how Washington has approaching bailing out the auto industry versus bailing out banks - a frequent complaint of industry advocates. Machine repairman Don Thompson, 56, of Macomb County's Chesterfield Township said the automakers are being punished because of anger over the financial bailout. "They're using us for the mistakes they've made in Washington," the 36-year Chrysler veteran said as he arrived Monday morning at Chrysler's Warren Stamping plant. Erin Wynn, a material handler at the same facility, said the difference between how the two industries are treated by Mr. Obama is "absolutely ridiculous." "I think there has got to be some kind of equality," she said. Chrysler's proposed deal with Fiat would give the Italian company a 35 percent stake in the U.S. automaker and entree into the American market. In return, Chrysler would get badly needed small-car technology. Mike Shepherd, 45, a die maker at Warren Stamping, was skeptical of the Fiat deal, noting that Chrysler's partners in past alliances - such as 1998's merger with Stuttgart, Germany-based Daimler-Benz, which dissolved in 2007 - aren't helping the company now. "I think Fiat's taking advantage of it to get the market share," the 17-year Chrysler veteran said. "It's going to help strengthen our backbone. It's going to help Chrysler be what it used to be 20 years ago," she said. But Wynn won't be there to see it. The 30-year-old has taken a buyout after nearly 11 years at Chrysler and plans to go back to school for her degree in psychology.